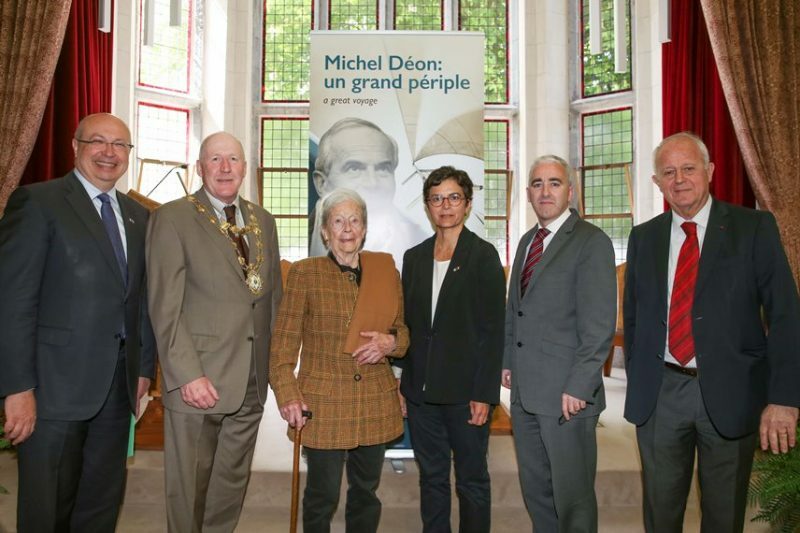 Adjunct Professor and honorary graduate of NUI Galway, the late Michel Déon was remembered on Wednesday of last week (26th April) at the University as the Chair of French will be named in his honour. The event took place as part of a day of tribute to the French author jointly organised by NUI Galway, Cúirt International Festival of Literature and the French Embassy, in the presence of French Ambassador to Ireland, M. Jean-Pierre Thébault, and of one of Michel Déon’s fellow members of the Académie Française, M. Frédéric Vitoux. “We remember with pride and affection the long friendship between NUI Galway and Michel Déon. Over many years, through his association with the discipline of French as Adjunct Professor, he showed generous support for our students and for our James Hardiman Library. His sharing of his vast collection of books with the University Library is a gesture which will be noted as one of great philanthropy by generations of scholars to come. Born in Paris in 1919, Déon spent over forty years in Tynagh Co Galway with his wife and family. He was one of the most respected writers of his time, a chronological span of some 70 years of writing from his first novel Adieux à Sheila (1944) to his last work – it comprises a total of more than 50 books and hundreds of editions. His works have been translated into German, Spanish, Portuguese, Italian, Greek, Turkish, Russian, Chinese, Lithuanian, Hindi, Japanese, Polish, and, in recent years increasingly into English. As part of the day of tribute M. Pierre Joannon, Irish Honorary Consul for the South of France, will perform the launch of Horseman, pass by!, Clíona Ní Ríordáin’s translation of Michel Déon’s Cavalier, passe ton chemin!, published by Lilliput Press (2017). Déon’s books have won major literary prizes including the Prix Interallié in 1970 for Les Poneys sauvages (The Wild Ponies), the Académie Française Grand Prix in 1970 for his novel Un taxi mauve (The Purple Taxi), set in Ireland, and filmed in 1977 with such famous names as Philippe Noiret, Charlotte Rampling, Peter Ustinov and Fred Astaire. He held the high rank of Commandeur of the Légion d’honneur, the order created by Napoleon to honour the highest achievements in civic and cultural life. In 1978 he was elected as one of the 40 members of the Académie Française, the greatest distinction a writer can receive in France. Best known for his novels and essays he also wrote children’s stories, plays, memoirs and travel accounts. Associated with many great names, he collaborated with Coco Chanel and Salvador Dalí. He was also acquainted with some of Ireland’s finest writers, Seamus Heaney and John McGahern among others. Similarly, as a writer and reader, Déon saw it as an important part of his role to encourage students by making literature accessible to them. Over many years, through his association with the discipline of French as Adjunct Professor in the National University of Ireland Galway, he showed generous support for students there, and shared his vast collection of books (7,000) with the University Library in a gesture of great philanthropy and friendship. Professor Jane Conroy of NUI Galway commented: “Michel Déon was seen as a ‘rebel’ in the world of French literature, and he never stopped questioning that world and thinking about how France and Europe were changing. We think of him as living between France and Ireland but actually he was at home in several cultures, Greece, Portugal, Italy…. and he knew several languages. He was able to translate Saul Bellow and Alarcón for example. He was loyal to France, but I think of him as a great European. It’s no accident that Les Poneys sauvages, one of his finest novels, takes us across several countries, including Ireland. I see him as being preoccupied with the future of European society and values. Certainly his experience during World War 2 deepened his awareness of the fragility of our civilisation.